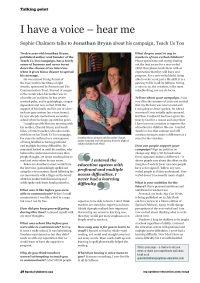 Sophie Chalmers talks to Jonathan Bryan about Teach Us Too, his campaign to give all non-verbal children the right to an education. Twelve-year-old Jonathan Bryan, published author and founder of the Teach Us Too campaign, has a lovely sense of humour and never turns down the chance of an interview when it gives him a chance to spread his message. He was named Young Person of the Year 2018 in the Shine a Light Awards, sponsored by Pearson and The Communication Trust. Starved of oxygen in the womb when his mother was in a horrific car accident, Jonathan has severe cerebral palsy, and is quadriplegic, oxygen-dependent and non-verbal. With the support of his family and his use of a low-tech eye gaze system (an e-tran frame), he now attends mainstream secondary school where he keeps up with his peers. I caught up with him one morning with his mother, Chantal Bryan, and Sarah Giles, a former teacher, who also works with him on his Teach Us Too campaign. For years he suffered as a consequence of being labelled as having profound and multiple learning difficulties. He remained locked in until his mother, who believed he understood a lot more than people thought, set about teaching him to read and write when he was seven. Below are Jonathan’s exact words from the interview, painstakingly spelled out using the e-tran system: Sarah following his eye movements with a finger on the board while his mother held his head up and softly spoke each letter Sarah pointed to. What was it like before you were able to communicate? How did you keep yourself going during this time? What was school like before you were able to communicate? Why do you think teachers weren’t attempting to teach you to communicate? 'I don't think people expect us to be able to learn. I don’t think teachers are trained to expect us to learn. How easy was it for you to learn to read? What does having a voice mean to you? What do you want to say to teachers of non-verbal children? 'Please spend time and energy finding out the best access for a non-verbal child; then please teach them with an expectation that they will learn and progress. For a non-verbal child, being able to write is not just a life skill. It is a gateway to life in all its fullness. Tell me about your campaign. 'I was very ill in the summer of 2016 and excited that my life here was near an end and I was going to Jesus’ garden. So when I recovered I was initially quite annoyed. How can people support your campaign? 'Sign my petition on change.org. Every signature makes a difference – it shows people care about the silent on the margins of society [over 260,000 people have so far signed]. 'I have personal ambitions and ambitions for teachers too. 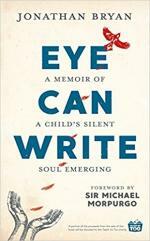 'Personal: my book, Eye Can Write, is being published on 12 July [look out for a review in a future edition of Special Children]. I pray it will change perceptions of the non-verbal and I am now excited about thinking what to write about next. This article originally appeared in issue 243 of Special Children magazine.